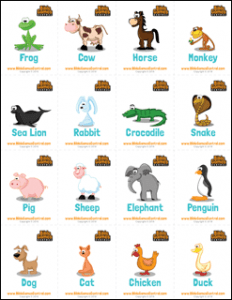 This animal matching game was shared by Bible Games Central. We hope it’s useful, especially in your preschool ministry. It’s an easy teaching activity for Noah’s Ark or the Creation Story. Please jump to their website to find similar ideas. Preparation : For up to 32 players: download and print 2 copies of the Animal Cards; cut each copy into 16. If you are playing with fewer than 32 players, you will need to remove some of the Animal Cards. (Ensure that all cards used are matching pairs.) If you have more than 32 players, you will need to print and cut up more copies of the same Animal Cards. Ensure there is an even number or players. If there is an odd number of players, have the game leader join in. Tell everyone that you will be giving each person one animal card. When they receive the cards, they must not show anyone their cards (they can hold the cards in their hands or hide them in their pockets). And they must not speak. Give one animal card to each player. Ensure that all cards used are matching pairs. On “go”, everyone must mimic their assigned animal, and move around the room to look for their counterparts. No speaking allowed. They can only imitate the animals’ actions and sounds. The first pair to match up and report to the game leader wins a prize. The game ends when all players successfully pair up with their counterparts. You can play more than one round. After playing this game, use this section to guide you in your lesson on Noah’s Ark. Alternatively, see the next section for a lesson guide on Creation. 2. Was it easy for you to find your counterpart? 3. Do you like animals? What are some of your favorite animals? 4. Do you know any Bible passages about pairs of animals? Why did God ask Noah to build an ark? In this story, we learned that God sent judgement on the earth because the people on the earth were evil. But God saved Noah and his family because Noah was righteous. Even though God promised (Genesis 8:21) that he will never send a flood like this ever again, this Bible story is still relevant to us today. Does God notice when we sin? How does God feel when we sin? Does God notice when we obey him? How does that make God feel? Conclude: Our actions matter to God, and he notices. Our sins make God sad. It is important that we always honor and obey him in our hearts and in everything that we do. After playing this game, use this section to guide you in your lesson on Creation. Did you enjoy this activity? Why or why not? Was it easy for you to find your counterpart? Do you like animals? What are some of your favorite animals? Do you know any Bible passages about animals? What are some things that strike you in this Creation story? What are some things that we learn about God? God is the Creator of all things. How should we treat God? What are some things that we learn about people? How do you think God wants us to behave in relation to one another and to all of God’s creations? Conclude: God is the Creator of all things: he deserves our honor, respect and worship. God made people in his own image: we must treat one another with the dignity and respect everyone deserves. Tony Kummer (Editor) reviewed & updated this page on : March 19, 2019 at 1:57 pm. All our content is peer reviewed by our readers, simply leave a comment on any post suggest an update.